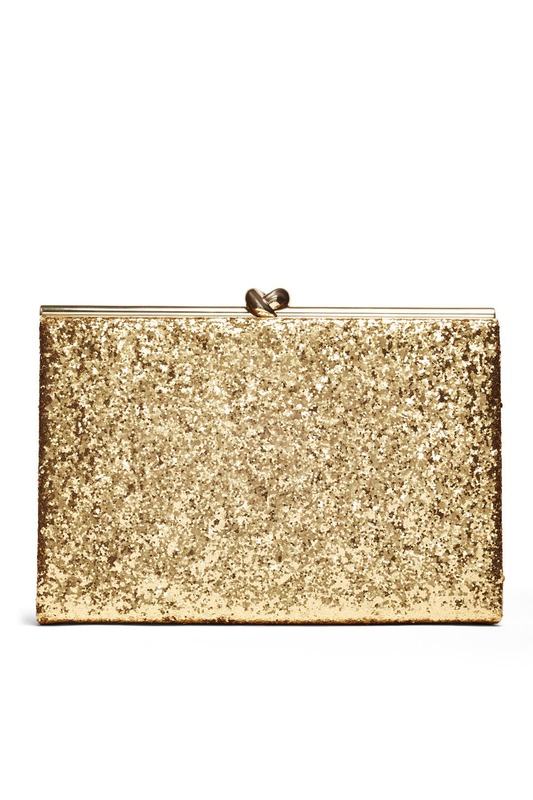 This golden, glittering kate spade new york accessories clutch is as bold as it is timeless. It’ll give your look a roaring 1920s twist. This cute clutch was not my first choice HOWEVER, it was the best accessory fail to have happened. It looked amazing with my decor and dress! I am so glad it was my back up! Super fun! Only complaint is it really hard to open. This bag is gorgeous and sparkly! 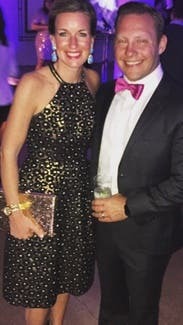 Used this for a work holiday party. It looked amazing and held my phone, a few credit cards and cash. The party was cocktails and we didn't sit ever, so it got annoying to carry around. Putting it under my arm was annoying because the sparkles were a little scratchy. Boxy so you have to pack it strategically- worth renting! I rented this to go with a dress I initially rented for a black tie, formal event. Unfortunately I didn't end up wearing the first dress I ordered and the bag didn't go with the backup dress. HOWEVER, I recommend this bag 100% as I received it with my first order. It is gorgeous and amazing - I wish I could have made it work with my backup dress! I liked that it wasn't super, super small and you could actually fit things in it. It's the perfect size! This clutch was so much fun! Perfect size! So cute. Did not fit a lot of stuff but it fit the essentials. Used it for my wedding as well as the rehearsal dinner. Love! Love! Love!!! Sooooo sparkly! Not a lot fit in this purse, but I didn't care. It was so sparkly and went with everything!!! LOVE IT! The purse in itself is a show stopper. It's absolutely even more beautiful in person.!! The purse paired amazing with the Red Layla Gown by Badgley Mischka. If you are looking for a statement clutch, this glittery piece is definitely what you are looking for! 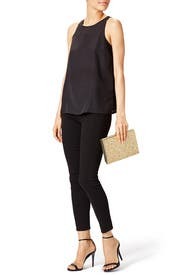 This Kate Spade clutch was absolutely beautiful. 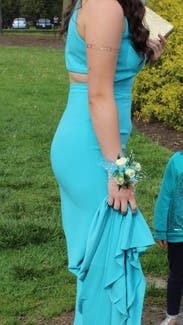 It went wonderfully with my dress to prom. The clutch carried 2 iPhones, lipgloss, perfume roller, gum, and keys. It was very difficult to open, but I figured it out towards the end of the night. When I was ordering this, I thought that the sparkles would come off, but not a single one did. I would definitely recommend this product. Beautiful and so so sparkly. 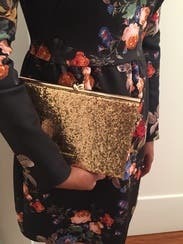 I received a ton of compliments on this clutch! I had rented this to go with the Badgley Mischka gold "Screen Siren" gown for a black tie gala. Upon receiving, it was bigger than I expected (which wasn't necessarily a bad thing), and also kind of narrow. However, though it doesn't look like it can fit much in it, I was pleasantly surprised about how well I could store the essentials in there without much hassle. I did notice by the end of the evening though that my arms were covered in glitter from the bag. I also got a small scratch on my arm from it (the material is a little rough). I'd absolutely rent it again. Beauty is pain sometimes lol. 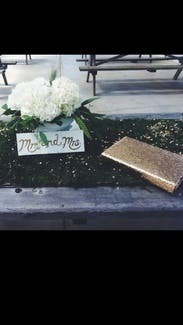 Loved the glam and glitz of this clutch. Added to the gold accents I put towards my outfit. One con is the glitter does transfer and fall throughout use. This bag is beautiful but very narrow - it barely fit my phone and a lipstick. Also the glitter is coming off on the corners from wear, though it it not noticeable. The glitter is gorgeous and it looks great, just not very functional. Gorgeous but sparkles were flying! Loved the is clutch but I was losing sparkles off of it at a rapid pace. They were on my face, in my hair - just about anywhere you could imagine. Totally adorable, but wish it shed a bit less! This was the icing on the cake with the dress I also rented. I loved it and think I might just have to purchase! 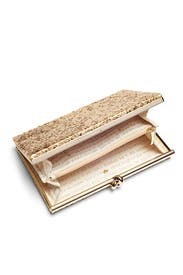 This clutch was the perfect pop to an understated elegant look. I brought it to a wedding and could actually fit all the things I needed for a first! Love. This clutch was amazing!!!!! Used it for my Art Deco themed wedding and it was great! Tiny bag that fit nothing. Either the clasp was broken or the bag was just tiny, but I couldn't fit a lipgloss, eye drops, cards and my IPhone in it at the same time. My husband ended up carrying most of my stuff. Very disappointing. This bag matches almost anything and is a great size. Holds phone, lipstick, cards and cash easily. Features wallet like slots inside and one zipper compartment. Loved it! Would love to buy it. Very fancy and shiny. This bag fits a surprising amount of things inside! Although I didn't use this bag for my night out, my friend did and it looked great with her outfit. When I received it, I was expecting it to be smaller in size but I was not disappointed that it was larger. It holds way more than you think. Perfect clutch for a night out! This was one of the only bags I could find that would fit my Iphone 6s plus. It was pretty, but the glitter kept rubbing off on my arm. It was a bit large and difficult to juggle while holding drinks. I received so many compliments on this clutch. 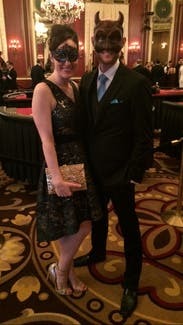 It was perfect for the Gala I attended. A bit larger than I expected; however, it still worked great. Lots of compartments on the inside and slots for your ID and credit cards. The perfect statement clutch! 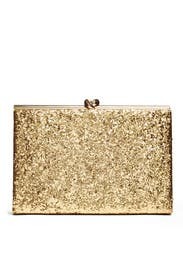 This gold glitter Kate Spade is bright and beautiful! The size is perfect to hold all your necessities. Pair it with gold jewelry to complete the look. Wore it to my engagement party. The clutch is very pretty in person. The clasp is hard to open and close but it stays closed once you latch it. Expect loose glitter. LOVED IT!!! 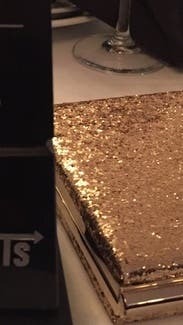 Got this for my birthday dinner/night out and it put the sparkle into everything!!! Fits lots of things which is super nice! All the pros! Obviously the clutch is covered in gold glitter so make sure not to wear anything that will catch on it (like fuzzy sweater, etc.). Great accessory for a fun night out! This purse is seriously perfection. 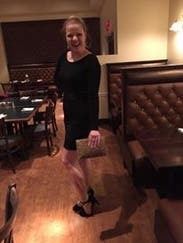 It's so fun and sparkly, perfect for a formal affair but also appropriate for a night out on the town, and the size is amazing. I fit my phone, charger, plus small wallet, keys, and lip gloss with no issue. I didn't have a problem with the clasp or with glitter getting everywhere. Loved this purse and wish I could have kept it! Absolutely love this clutch! It adds great bling to any outfit. My one and only complaint about the clutch is it is a little tricky to open. But, other than that, it was perfect and fit everything I needed in it for a night out. I liked how structured this clutch was (and fit way more items in it than I anticipated)... - the only tricky part was figuring out how to open the darn thing! It matched perfectly with my outfit, gave a great pop of visual interest. I loved the clutch once I figured out how to successfully open it (*womp womp*). I struggled a lot with the clasp. It fit soooo much stuff though and I was able to carry all my essentials seamlessly. My only negligible grievance was with the glitter; it comes off VERY easily and when one is struggling to open the clutch as I was, glitter was everywhere. It looks like a very fashionable pixie exploded in my house presently. Big enough to fit my phone, makeup and all the essentials. Worked PERFECTLY! Gorgeous and held everything I needed. This is the perfect size for a cell phone and a few cards... the sparkle is gorgeous. I received so many compliments. Wish I owned this! I didn't end up using this purse for my elopement, but it would've fit the essentials. It wasn't quite as high-quality as I was expecting, but it was pretty and functional for sure! I rented this for a weekend filled with a fancy rehearsal dinner and black tie wedding for a family member. This was the perfect accessory for both events. Somehow I forgot to photograph it :( I would buy this if I could! I received a ton of compliments. I did not have any issues with the clasp, as other mentioned. I also was able to fit a lot, which was necessary, since I had my toddler in tow: mints, a Kind bar, lip liner and gloss, cash, ID, and phone.